When it comes to choosing a kitchen style for your Florida kitchen remodel you should take a good look at the traditional kitchen. It has continued to remain a popular choice. Traditional kitchens don’t seem to go out of style and are a safe choice if you are planning on selling anytime in the near future. Not everyone is a cook. So if you are that person that doesn’t cook sometimes it is hard to think about remodeling a kitchen and spending that extra money. What you need to realize is that whether or not you cook, kitchens are the heart of the home. There is so much more that can be included in your kitchen remodel that will give you the added benefit. It is more than just beautiful room that will help you resale your home should you ever decide to move. Why not remodel and utilize the space you have and design a kitchen that not only looks great but you can use as well. It’s always the little things and extras that sometimes seem to make the biggest difference. You can have two kitchens that are almost identical except for the lighting and they look completely different. One might be more inviting and highlight special features while in the second kitchen these features go relatively unnoticed. What’s the difference? The lighting the homeowner is using. When it comes to remodeling a kitchen a lot of anxiety can sometimes accompany this big decision. For example will I like the lay out of my kitchen? Fortunately today a lot of the things we used to worry about are alleviated through Computer Aided Design (CAD) programs. Before CAD, homeowners were forced to use a lot of imagination, and have a lot of faith that they were getting what they really want. The kitchen designer would make a hand drawn representation of what the kitchen would look like. If you, as a homeowner, were lucky, you would actually get someone who was an artist so you weren’t left looking at a rough sketch that resembled a blueprint. In the end, many people were often disappointed because what they envisioned and the kitchen designer’s interpretation didn’t match up. People considering a kitchen remodel are not only looking to update their kitchens, but find a look that won’t go out of style. They want something that will give that extra little bit of charm. Everyone wants that designer kitchen. Sometimes not all kitchens are practical nor do they make sense if you have kids. So how do you get that designer kitchen, but one that still functions and meets the needs of your family? 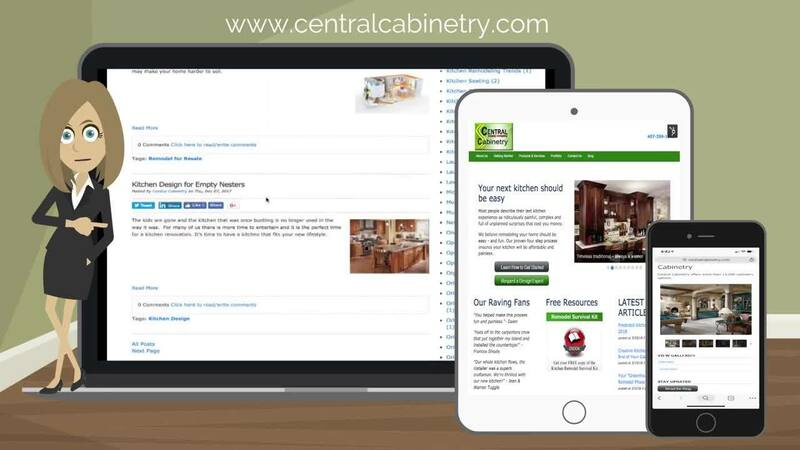 Here at Central Cabinetry our design experts know and understand that the kitchen is the central part of your home. A majority of the activity that happens in the home revolves around the kitchen. Over the past couple of decades there has been an ever-increasing trend of more open space around the kitchen. While there are still plenty of homeowners opting for more separation or closed off space, an increasing majority decides to tear down those walls (being mindful of load bearing walls, of course!) and turn their kitchen, dining area and main living space into one huge room. If you’re like most people who eat and cook at home, you would love nothing more than to own a large, efficiently designed, stylish kitchen (with plenty of counter space and storage). Unfortunately, not every home can facilitate a large kitchen, so many homeowners are left daydreaming about someday in the possible future when they may get their wish. If you’re remodeling your forever home or even if you’re trying to sell, it is important to think about long-term comfort as you make decisions about the layout and design of your space. The great thing about incorporating universal design features into your space is that many of them are built with ease in mind. That means, they’re not only good for homeowners who are getting older or for people with limited mobility – they’re great for everyone.